James, Recorded Live In Concert The British rock group released one of the best songs of the 1990s, "Sit Down." Now, almost 30 years after they first got together, the Brits are back with a new album and a U.S. tour. Listen to their stop in Philadelphia live from World Cafe Live at noon ET. The veteran Brit-pop act James visits World Cafe Live on Friday for a live webcast. James was part of the tidal wave of Brit-pop acts in the early 1990s that produced hit after hit after hit. The Manchester band's chief contributions to the era were 1991's "Sit Down" (a stone cold classic) and 1993's "Laid" from the Brian Eno-produced album of the same name. With millions of records sold and the Brit-pop era essentially over, the modern rockers broke up in 2001. 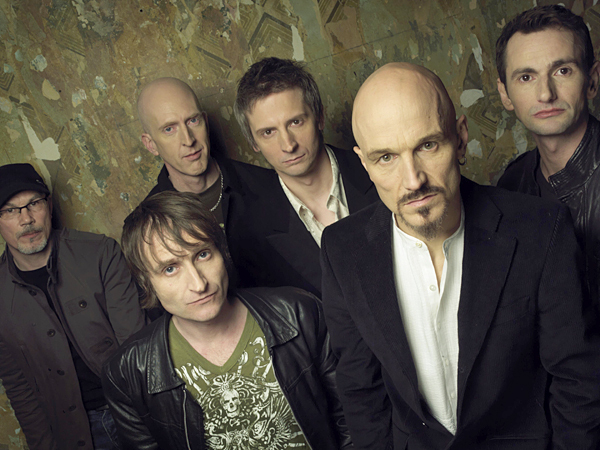 But an itch remained, and when founding members Larry Gott and Jim Glennie contacted lead singer Tim Booth, it was back on. The band released the comeback album Hey Ma in 2008 and now are back with a double-album, The Morning After the Night Before, which hit stores on Sept. 14. Listen to James perform songs from its new record (and "Laid") from World Cafe Live in Philadelphia.